My name is Wiebke Hoogklimmer and I am a classical singer (Contralto). 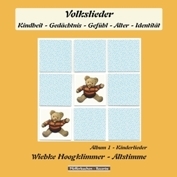 The idea of recording German Volkslieder (Folk Songs) is closely connected with my mother`s Alzheimer’s disease. My mother, born in 1928, was diagnosed with Alzheimer’s in 2000, and the illness progressed slowly in the beginning. Since 2010, however, her illness had been at an advanced stage, which means that she had stopped speaking, she could not move on her own and she needed 24 hours help for everything. Since 2009 I noticed that my mother was losing her ability to speak. Even the speech therapist could only delay this but not stop it. This is when I started singing German Volkslieder with my mother. The exciting thing was that my mother, who was speaking less and less, suddenly said “beautiful” while I sang, or said other words which she had not used for a long time, or suddenly started singing the words along with me, even complicated phrases. 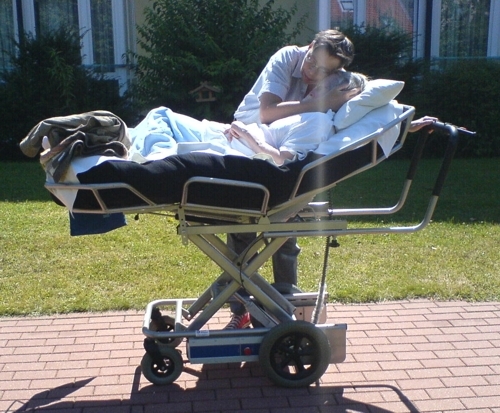 In the video you see my mother at an advanced stage of the illness. You can see clearly how she is trying to communicate with me, she is even saying “yes”. We recorded this video with a very small basic camera. So although we tried our best to get the sound, it is very bad. But in spite of the sound I think you can get the impression that my mother is excited to communicate. My brother is standing behind the camera. That is the reason that my mother is looking into the camera again and again. 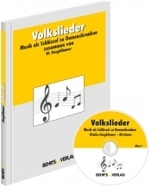 I had the idea of recording the common German Volkslieder in the same fashion as I sing them to my mother - with my low voice, without instrumental accompaniment, with maximum clarity - to offer them as CDs and MP3 downloads, and to lay out the website www.volksliedsammlung.com with it. The thought behind it is that other relatives might find it easier to sing with their father or mother when they could sing along with a CD. In addition, the acapella voice can be used by music therapists as singing karaoke and be accompanied with the guitar or other instrument, and people with dementia could play along using percussion etc. For this reason I purposely recorded most of the songs in C or G major. Of course I also thought about children when singing the songs, because language development can be supported with singing folk songs! At first I only wanted to record the two songbooks in large print which are commonly used in German nursing homes. However, as I only wanted to record songs that are free to use and not bound by copyright, I became interested in the authors of the songs, and was surprised to find the songbooks often only cited authorship as “traditional”, “old song” etc., although some writers or composers actually had not been dead for 70 years, which is the cut off year for paying royalties. So I did a lot of research which I had not planned originally. On my website as well as here in the booklet you now find the lyrics of the songs with the correct author attributions. Among other sources, the research of the “ Deutsches Volksliedarchiv” was a great help. You can look this up on their website: www.liederlexikon.de. On top of that I worked at my desk with about 15 song books from the “Wandervogelzeit”, which covers the 1920s to today. To date I have about 350 songs in my collection, but it is my goal to expand the collection further. In addition, you can find on this website links to articles that prove scientifically the effect of music on people with dementia, also links to informative sites for relatives of people with Alzheimer’s disease, and a guest book for communication. This Website is online since 12/30/2011. 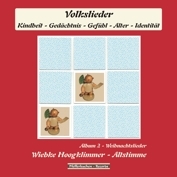 2012 I released the Kinderlieder-Album 1 under my Label Pfefferkuchen Records, 2013 the Weihnachtslieder-Album 2 was following. Since 2012 I am collaborating with the BEHR'S Verlag. 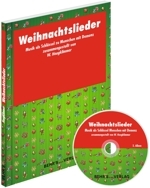 The BEHR'S Verlag is publishing large-print songbooks with sing along CDs with my German Folksongs. In der Nacht zum 21.9.2014, einen Tag vor ihrem 86. Geburtstag, ist unsere Mutter vollkommen friedlich einfach eingeschlafen. Obwohl wir uns solange auf den Abschied vorbereiten durften, hätte ich nie gedacht, daß es dann doch so ein Schlag sein würde. Aber wir sind dankbar, daß sie in den letzten Jahren nicht gelitten hat, Musik, die Sonne, den Wind, das Essen, gebadet zu werden etc. genoß und uns mit ihrem liebenswerten Wesen erfreute. Nun hat sich ihr Kreis geschlossen.